Admire all of Palma de Mallorca’s spectacular sights on a 4-hour private sightseeing tour of the city. Accompanied by an accomplished guide, visit legendary landmarks such as the Old Town and the Almudaina Palace while listening to tailored commentary. 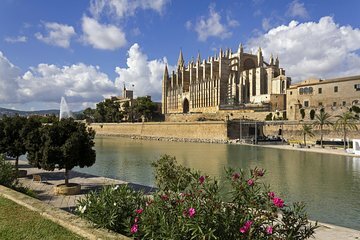 Marvel at the dazzling interior of the Palma Cathedral, a magnificent architectural achievement by Antoni Gaudi, then relax during a tranquil cruise around the Bay of Palma and the picturesque port. Enrich your knowledge of Mallorca’s capital during this comprehensive tour of the city. As this is a tailored tour it can start at whatever time you wish. We will adapt the itinerary to your time of choice. Please at the time of booking, indicate at what time you want to start the walking tour. Greet your private guide at a central location in Palma de Mallorca and stroll leisurely to a district hailed at the ‘monumental area’ due to its plethora of significant landmarks. Respond to your guide’s informative commentary with as many questions as you wish to enrich your knowledge of the island’s cultural history. Capture photographs outside the magnificent Palma Cathedral (Le Seu) and listen to tales of the structure’s radical transformation. Delve into the intricate interior to discover prismatic stained glass windows and the gloriously controversial Modernist altarpiece. Admire the imperial majesty of the Almudaina Palace, formerly an Arabian fortress, then stroll the serpentine streets of the Old Town to visit the historical city walls. Absorb panoramic vistas of the Bay of Palma and they city’s picturesque natural perimeter. Climb aboard a boat and embark on a tranquil 1-hour cruise of the bay from a unique perspective. Listen to informative narration then bid farewell to your guide when the tour concludes back at the port.